Returning from a big adventure is always hard. I usually go through withdrawal. Wanderlust inevitably takes hold, making me immediately want to start planning another trip. A few weeks ago I shared a post about Lugana, one of our stops on our recent Italian adventures: One Afternoon in Lugana at Podere Selva Capuzza. We recently opened a bottle of one of their wines as a balm to ease the longings for more adventures and to reminisce about the one we’d just had. Lugana is a lovely wine region near the shores of Lake Garda. It’s still relatively unknown region (in the US anyways), that focuses on Turbiana, a white grape that is closely related to Verdicchio. On our visit we had the chance to visit and taste with Luca Formentini, owner of Podere Selva Capuzza and president of Lugana’s Conzorzio. Check out my previous post to read more about the region and our visit, but I’ve come to have a real appreciation for Turbiana and its versatility for food pairing. 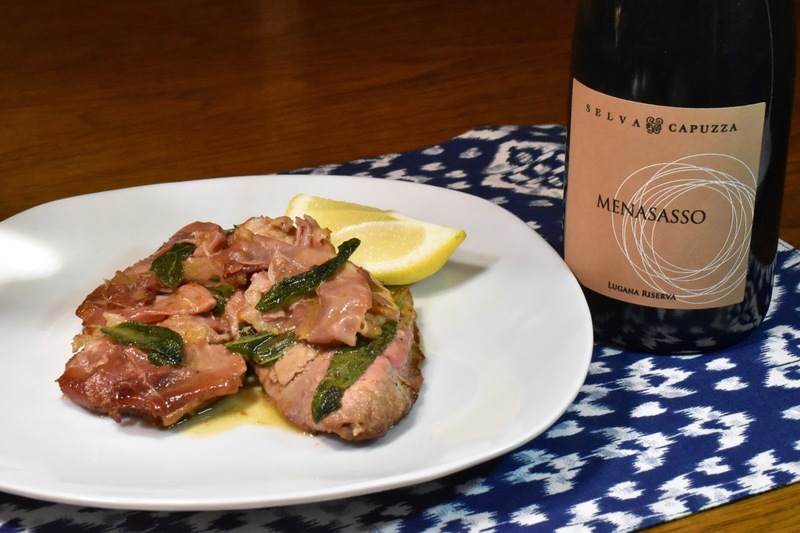 Shortly after we returned from our trip, we decided to open our bottle of Lugana Riserva Menasasso 2013––the first bottle to be opened of all our drinkable souvenirs. Since I’ve already covered the winery and region, today I’m gonna jump right to the food! On the day we opened our bottle we picked up fruit notes on the nose of golden apples, stone fruit, a touch of hay, and tangerine, as well as lots of stones. On the palate, it was rich and layered with apricots, those gold apples again, melon, and grilled lemons. There were also more complex notes of beeswax, honeysuckle, cheese rind, honeycomb, something yeasty (Greg got a whiff of “vegemite”– he assured me he meant this in a completely positive way), a little spice, a hint of smoke, and lots of stony minerality. A really complex wine. As you can see, this is a bottle with a few years on it, even though it is current release. From this you might be able to guess that Turbiana is capable of aging. I wish we’d been able to bring back a second –– I’d be interested to see how all those interesting layers develop with a few more years. From the first time we tried this wine in Lugana, Greg wanted it with anchovies on buttery toast points. Specifically, he wanted Spanish boquerones. 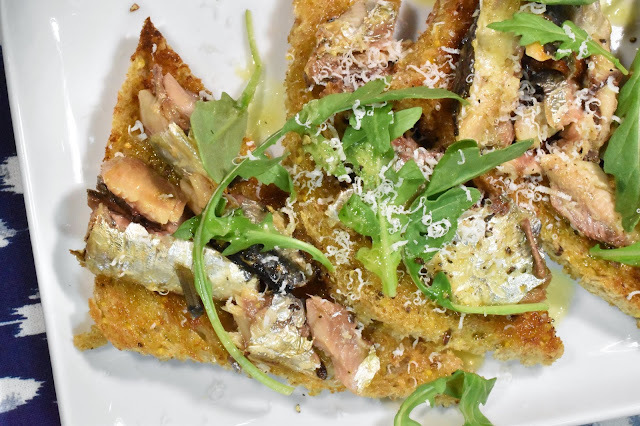 I figured we could make his vision a reality, but since we didn’t have boquerones on hand, I opted to use sardines. The result was a very quick and easy appetizer. 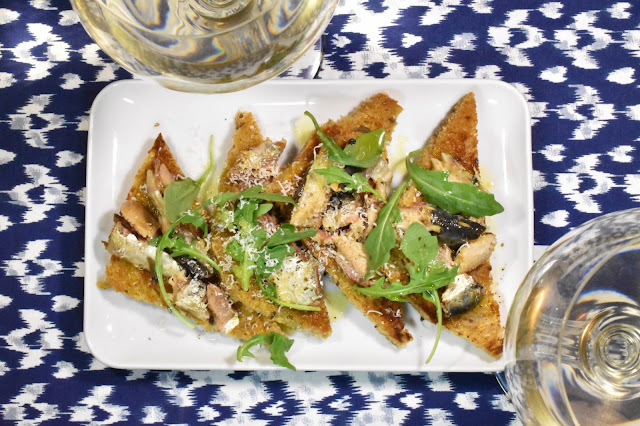 He was still in the seafood camp this time around, but it also occurred to him that the savory/creamy combo of flavors in this wine would work with a Caesar salad. Simple enough. We could easily have that on the side. While I fully agreed that this wine would work with seafood easily, I also thought it’d be a good match for a lighter meat. My brain kept spinning around components like veal, pork, citrus, and cream sauce. Greg cut in, “How about that dish you love? 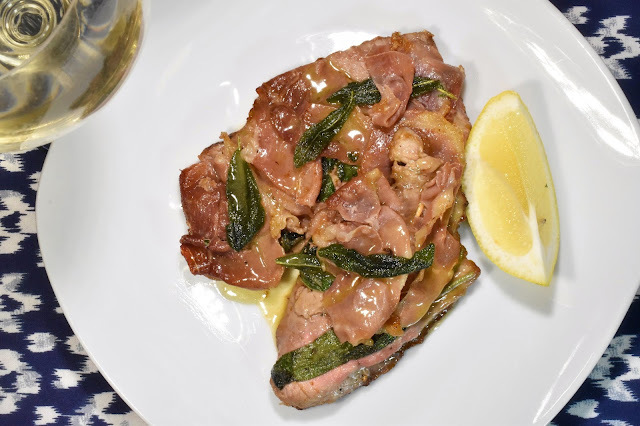 The one with prosciutto on top.” Saltimbocca. Good call Greg. Full of good ideas! I do really love this Roman dish and we hardly ever have it. It’s a huge shame since it comes together quickly. I also feel the dish does just as its name advertises; it jumps in the mouth! So, I decided not to reinvent the wheel this time. I just tweaked things ever so slightly to better suit the wine. My first thought was to swap out the Marsala, which is often used, for a splash of lighter white wine. I found a recipe on Serious Eats that already did this, so I used it as my guide, but then made a few other minor changes. The Serious Eats recipe infuses the sauce with sage leaves towards the end, then pulls out the spent leaves before serving. I REALLY love crispy sage leaves, so I thought it a terrible waste to let them go soggy and toss them out. I decided to crisp them up at the beginning, infusing the oil from the start, then I used the crisped leaves as a garnish at the end. A final minor modification came out of necessity. I found speck, rather than straight-up prosciutto at the store. It’s a subtle difference, so either option works well. That said we really thought the added smoky flavor from the speck worked beautifully with the wine and played up the similarly smoky notes in the wine. We had ourselves quite the feast with this wine! What was particularly fun about this was that each dish brought out different aspects of the Lugana. It did indeed work nicely with the Caesar salad. The sardines really brought out the minerality in the wine, while the buttery toast points matched the creamy mouthfeel. On the other hand, alongside the saltimbocca the wine became really velvety and luscious, while the speck spoke to the salty/minerally notes in the wine. This was an altogether magical and seamless match! The winery considers this their signature Lugana, made from their oldest vineyard (40 years old) and at the highest elevations. Produced from a selected plot within the Selva Cru, the Menasasso grapes, that make up this rich and refined white wine, are harvested few days after the regular vintage to explore the full potential of the this wonderful vineyard. A small part of the must is fermented in small oak barrels exclusively with the aim to impart extra complexity to the finished wine without imparting undesired wood flavors. 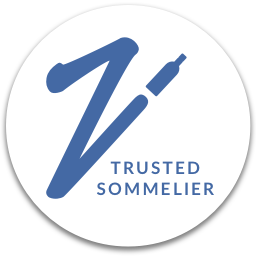 The average price for this wine on Wine Searcher is $20 – I think that’s awesome QPR making this wine a definite Over Achiever. Sadly, Selva Capuzza’s wines are not available in the US at the moment. I really hope that will change soon! In the meantime, you can find other excellent Lugana wines in the US. Ottella makes another bottling that I’ve often enjoyed. Lugana’s wines range in styles from light and crisp, to fuller like this one. Look for one on the fuller end of the spectrum. I think Soave Classico would make another wonderful option for this dish. In general, look for medium to fuller bodied white wines with a hint of an herbal note. If you prefer a New World option, try a buttery Chardonnay that keeps the oak light. In addition the dishes below and those we discussed with Luca on our visit , we also considered pizza with white sauce and prosciutto, buttery lobster, chicken, veal, or pork with light, creamy sauces. 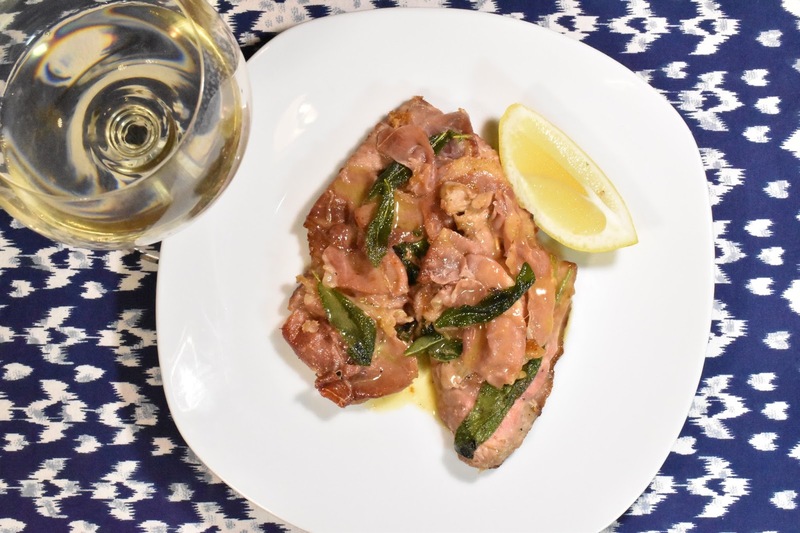 In addition to saltimbocca, this would be a great match for piccata. Given the versatility of this wine, I think it would also make a great addition to the Thanksgiving table! These take less than 10 minutes total. This makes two appetizer portions. This is a bit of a non-recipe as these amounts don’t need to be exact. 2 slices of bread, crusts cut off and cut in half into triangles. 1. Melt butter in a pan over medium heat. Add the bread to the pan and allow it to toast until golden brown, flip and crisp on the second side. Remove from heat. 2. Flake sardines (remove any bones in the process) and distribute over the toasts. 3. 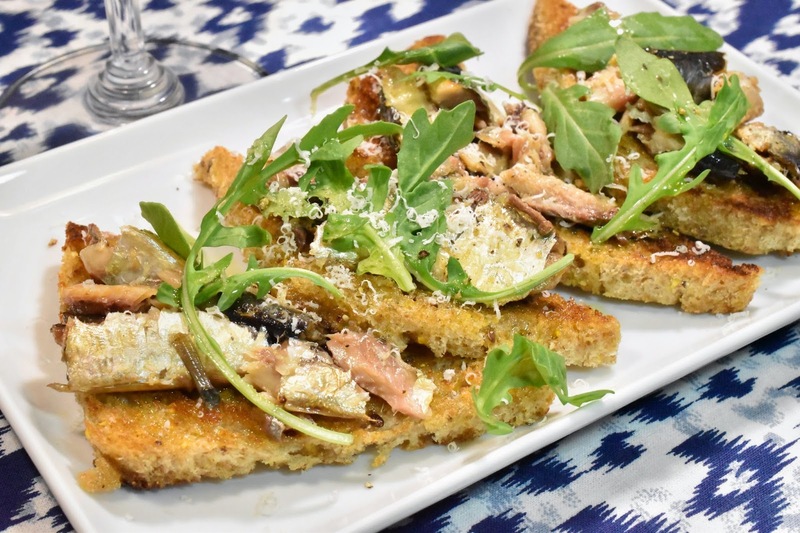 Garnish each toast with a few arugula leaves, sprinkle with a little Parmesan, drizzle with a little olive oil, and season with a sprinkle of salt and pepper. Serve. Adapted from recipe on Serious Eats. 1. Arrange cutlets on a work surface, cover with a sheet or two of plastic wrap, and pound each with a meat pounder or the bottom of a small heavy saucepan or skillet until no more than 1/4-inch thick throughout. Season lightly on one side only with salt and pepper. 2. Flip veal cutlets so that the salted side is down. 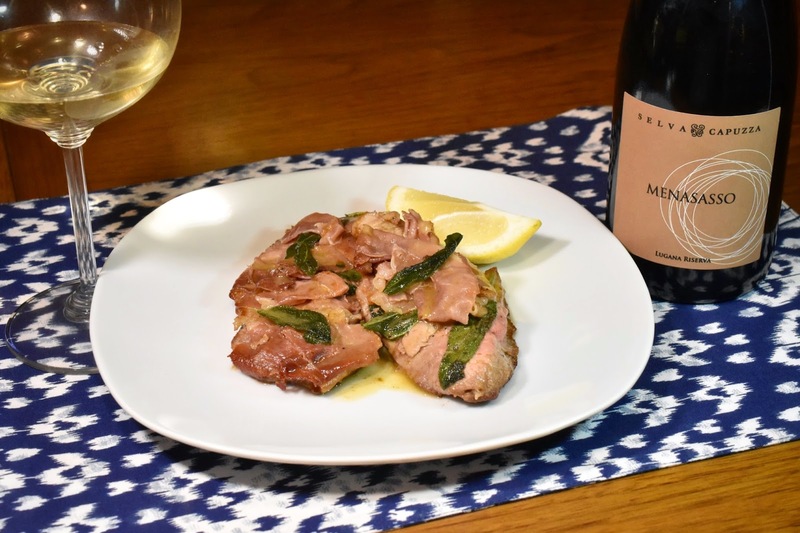 Pick eight of the the largest sage leaves from your bunch and lay one in the center of each cutlet; if the sage leaves are small, use two per cutlet. 3. Lay a slice of prosciutto on top of each cutlet, sandwiching the sage leaves flat between them. Using two wooden toothpicks per cutlet, fasten the prosciutto to the cutlets (the easiest way to do this is to push the toothpicks down through the prosciutto and just into the veal, then back up through the prosciutto again, much like fastening them together with a safety pin). 4. Pour about 1/2 cup of cornstarch into a wide, shallow bowl. Dredge the underside of each prosciutto-topped cutlet in the cornstarch, shaking off the excess. 5. Separate the remaining sage leaves. In a large skillet or sauté pan, heat a generous pour of olive oil over high heat until shimmering. Add the leaves and allow to crisp for a few seconds in the olive oil. Transfer to a paper towel and sprinkle with salt. 6. Making sure not to crowd the pan, add cutlets in batches, prosciutto-side up. Cook, swirling the pan occasionally, until the cutlets are lightly browned on the bottom and the last traces of pink are visible on top at the edges. Use a spatula to gently flip all of the cutlets prosciutto-side down, then flip them back immediately. Transfer to a clean platter. Lower heat at any time while cooking the cutlets to prevent burning. Add additional oil to the skillet if needed, and continue cooking the cutlets in batches until all are cooked. 7. Lower heat to medium-low and add butter allow to melt completely. Add white wine. Bring to a simmer over medium heat, stirring and scraping up any browned bits, then continue to cook, stirring and swirling constantly, until sauce is emulsified and slightly thickened (exact time can vary significantly depending on your skillet size and burner power; increase the heat at any time if it seems to be taking too long, or lower the heat if it's reducing too quickly). 8. Season with salt and pepper, then stir in one teaspoon of lemon juice. Taste and adjust seasonings and add more lemon juice, if desired. If the sauce breaks at any point, whisk in a tablespoon or two of water to bring it back together. Pour sauce all over veal cutlets, sprinkle the crispy sage leaves on top, and serve right away. Serve with addition lemon wedges if desired.